FORTY percent of Northern Ireland’s post-primary schools have failed to meet a key exam result target set for schools in England, The Detail can reveal. Our analysis of the 2013 examination results for Northern Ireland’s schools confirms that 82 of our secondary schools fell below the English minimum “floor standard” of at least 40% of pupils achieving five or more GCSEs at grade A*-C, including English and maths. In England, 71% of maintained secondary schools – which are funded by central government through local authorities – meet this key benchmark target. The results achieved by every grammar and secondary school in Northern Ireland in last summer’s GCSE and A-Level exams were released to The Detail by the Department of Education in response to a Freedom of Information request. In response to our findings, Education Minister John O’Dowd said he agreed that the levels of underachievement in our education system remain “unacceptably high”, particularly among pupils who are entitled to free school meals. All of Northern Ireland’s 68 grammar schools – which continue to select their Year 8 pupils using academic tests – exceeded the English target in the 2013 GCSE examinations. Mr O’Dowd said recently that the wide range of grades accepted by a large number of grammars means they are now “mixed-ability in all but name”. However, Professor Tony Gallagher from Queen’s University Belfast stressed that the social gap between grammar and secondary schools, particularly in the Protestant sector, remains very wide which makes direct comparison with the English schools system problematic. The data we received from the department is available in full in Excel format below this article. A total of 22,580 pupils in Year 12 were eligible for GCSE examination entry in Northern Ireland in 2012/13 – 9,334 in grammar schools and 13,246 in non-grammars. Over 12,940 pupils in Year 14 sat A-Level examinations. A detailed breakdown of the grades obtained by pupils attending each of the 206 schools – 138 secondary and 68 grammars – can be accessed in our interactive map above. The exam result data includes qualifications equivalent to GCSEs and A-Levels. This is despite the fact that the data we requested includes a breakdown of free school meal entitlement rates for each school (a deprivation measure), the percentage of pupils at each school with special educational needs and also each school’s attendance record (an issue identified by academics last year as having an important impact on educational performance). 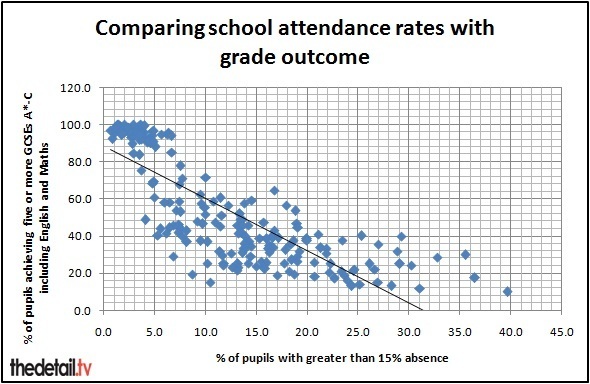 The attendance figures are for the 2011/12 school year as this is the most recent data available. Overall, almost 61% of year 12 pupils achieved five or more GCSEs at grades A*-C last year, including English and maths. However, when you compare pupils entitled to free school meals and those not – 33.9% of pupils entitled to free meals achieved this, compared with 66.7% of non-free meals pupils. Over 65% of Year 14 pupils achieved three or more A-Levels (including equivalents) at grades A*-C. However, only 50.9% of A-level pupils entitled to free meals achieved this. The data we requested is taken from the Summary of Annual Examination Results process, which collates summary school level examinations data and validates it with schools. The figures we have may be subject to minor revision. It excludes special and independent schools. This year, for the first time, summary data on pupils with free school meal entitlement (FSME) was collected and validated by the department to allow for analysis of the percentage of FSME pupils achieving a range of benchmarks. Four of the top five non-grammar schools with the highest percentage of pupils achieving at least five GCSEs at grades A*-C, including English and Maths, were Catholic maintained schools. They are Saint Catherine’s College in Armagh (71.7%), St Patrick’s High in Keady (69.6%), St Patrick’s Co-Ed Comprehensive in Maghera (68.2%) and St Patrick’s College in Banbridge (64.6%). Also included in this top five was controlled secondary Rathfriland High where 71.2% of its 63 Year 12 pupils achieved this standard. Only 10% of pupils at Belfast’s Orangefield High achieved five or more GCSEs A*-C including English and Maths. This was the lowest percentage in the data provided to us on non-grammars. Earlier this week Education Minister John O’Dowd approved the closure of Orangefield. In Northern Ireland there are 10 non-grammars with 50% or more of their pupils entitled to free school meals. These are the schools with the most deprived pupil populations. This category includes Orangefield High. However, over 35% of the pupils achieved the same key five GCSEs benchmark standard at Newtownabbey Community High where almost 51% of pupils are entitled to free meals. Less than five of the 45 year 12 pupils enrolled at St Paul’s Junior High in Craigavon achieved the GCSE benchmark – although the exact number was not provided by the department to prevent individual pupils being identified. We also requested data on the percentage of pupils achieving seven or more GCSEs at grade C or above (including English and Maths) in each school. The non-grammar school ranked highest in this category was again Saint Catherine’s College in Armagh (71.7%), closely followed by Rathfriland High (71.2%). Only 10% of the Saint Catherine’s pupils had an attendance rate of less than 85% and the overall school attendance rate was 93% – this compares to almost 40% of pupils with a poor attendance record at Orangefield. However, mitigating factors include that both the percentage of pupils entitled to free school meals and with special educational needs were much higher at Orangefield (over 54% of pupils in both categories) compared to Saint Catherine’s. We have grouped the exam results of the non-grammar schools according to their level of free school meals entitlement. This enables readers to compare schools with a similar pupil intake. To see these tables click here. The interactive map above provides a more detailed breakdown of the data we received for each school. St Catherine’s College’s principal Deirdre McDonald told The Detail she was extremely proud of the “superb record of academic success” of her students. She said: “They achieve outstanding grades, both at GCSE and A-Level, year on year, here in our all-ability school. “This is the result of great teamwork – the students work hard, supported by the expertise and dedication of our staff and by the commitment of their parents. “Furthermore, the ethos of Sacred Heart Education, which permeates everything we do, is definitely a factor which contributes to the success of our students. “In a recent inspection, Saint Catherine’s College was deemed ‘outstanding’ in every aspect of school life. Only 12 of Northern Ireland’s 68 grammar schools had 10% or more of their pupils entitled to free meals – compared to 137 of the 138 non-grammar schools. However, as with last year, despite a much narrower deprivation range than the non-grammar sector, there were still significant differences in the performance at grammar schools. 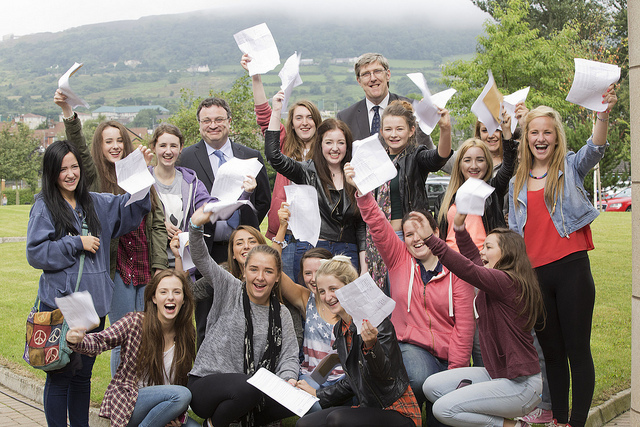 The percentage of pupils achieving five or more GCSEs A*-C including English and Maths ranged from 100% at five Catholic grammars (Rathmore in Belfast, Lumen Christi College in Derry, St Mary’s Grammar in Magherafelt, Our Lady’s Grammar in Newry and St Joseph’s Grammar in Dungannon) down to 57.5% at Strabane Academy and 68% for St Mary’s Christian Brothers’ Grammar in Belfast. Strabane Academy was formed by the amalgamation of Strabane Grammar and Strabane High in 2011. It is also worth noting that 23% of the pupils attending St Mary’s CBS in Belfast and Strabane Academy were entitled to free school meals – this is the highest among the grammar sector. Only 1.1% of pupils at Campbell College in Belfast are entitled to free meals. 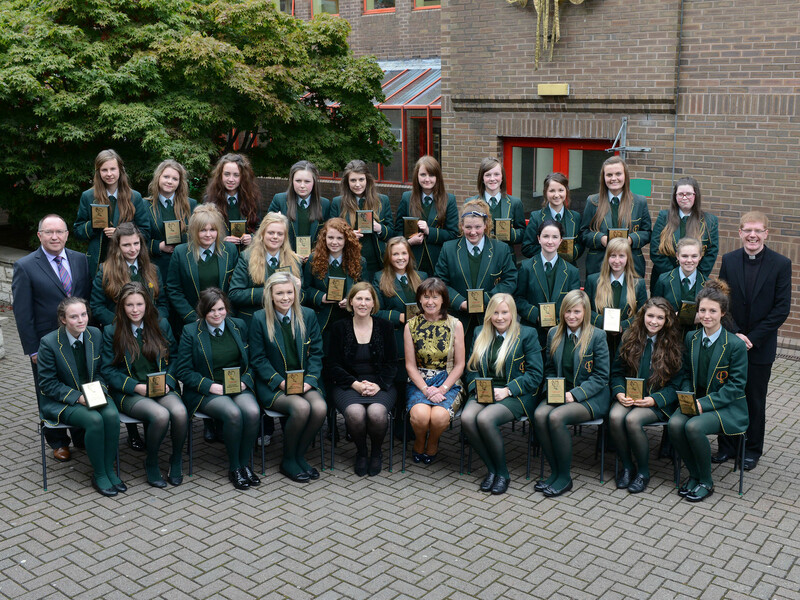 Lumen Christi went one stage further with 100% of its year 12 pupils achieving at least seven GCSEs at this standard. St Mary’s Grammar in Magherafelt followed closely behind at 99.4%. At St Dominic’s High on Belfast’s Falls Road 96.5% of the pupils sitting A-Levels achieved three or more grades A*-C.
This was followed by 91.5% of pupils at Lumen Christi, St Louis Grammar in Kilkeel (91.3%) and Dominican College in Belfast (91.2%). Only 46% of the 92 Year 14 pupils at Campbell College in Belfast achieved this standard. To see our table showing the grammar schools’ results, click here. And explore the map above to see a more detailed breakdown of the data for each grammar school. We asked Patrick O’Doherty, principal of Lumen Christi College in Derry, to comment on his pupils’ academic success. He said: “We are obviously delighted that our students have attained excellent results. Table compiled using DENI data. Each point represents a school. Last year, academics from the University of Ulster said that quotas should be set for our grammar schools to ensure that they select more pupils entitled to free school meals and with special educational needs to better reflect the communities which they serve. This was one of the key recommendations from Vani Borooah and Colin Knox in their response to an Assembly education committee inquiry on the school inspectorate and school improvement process. They also analysed the variables which determine educational performance and found that the top three variables were being a grammar school, the school attendance rate and the proportion of free school meal children in the school. Inspired by their report, our Freedom of Information request also included asking for attendance data for each school. Attendance or absence is measured for every pupil in half day sessions (morning and afternoon) and each year there are 190 statutory school days. As well as each school’s average attendance rate, we also asked for the percentage of pupils in each school with attendance below 85%. This is the point at which pupils can be referred to the Education Welfare Service (EWS) which may then formally intervene with families. Schools are expected to take action on falling attendance in the form of letters written to parents and meetings with them. When levels falls below 85%, a referral from the school to the EWS can result in a home visit and an action plan being drawn up in a bid to improve attendance. In cases of extremely poor attendance, sanctions can be imposed on parents/guardians. This includes a referral to the EWS or prosecution resulting in a fine or – in more extreme circumstances – an Education Supervision Order or Care Order. The attendance data released to us by the Department of Education relates to the 2011/12 academic year as this is the most recent available. The average pupil attendance across all post-primary schools in Northern Ireland was almost 93% – 95.6% in grammars and 91.2% in non-grammars. Using school enrolment figures for the 2011/12 year, we calculated that a total of 14,415 post-primary pupils had an attendance level below the crucial level of 85%. This is 10% of the post-primary school population that year, with the vast majority concentrated in the non-grammar sector. Overall average school attendance rate for 2011/12 ranged from over 97% at six schools – Aquinas Diocesan Grammar in Belfast, Friends’ School in Lisburn, Rathmore Grammar in Belfast, St Patrick’s Grammar in Armagh, St Patrick’s Grammar in Downpatrick and Wallace High in Lisburn – to 82.6% at Orangefield High in Belfast. Almost 40% of pupils at Orangefield had an attendance record of below 85% compared to just 0.6% of the pupils attending St Patrick’s Grammar in Downpatrick in 2011/12. This was the lowest for any school. At 50 schools, 100 of their pupils or more had an attendance rate below 85% in 2011/12. These schools were all non-grammars. The interactive map above includes details on each school’s attendance rates. We asked John O’Dowd to comment on the academic outcomes and also for his view on the importance of school attendance. He said: “I agree that the levels of underachievement in our education system remain unacceptably high, particularly among pupils who are entitled to free school meals. “Work is ongoing within my department and the wider education sector to tackle this important issue. The Minister said that he has a coherent set of policies in place designed to improve educational outcomes for young people and to address the root causes when pupils are not achieving to their full potential. He continued: “It is true that regular school attendance and educational attainment are inextricably linked. “Regular attendance ensures that pupils get the best possible outcomes from their period in compulsory education and improves their chances of employment and life chances in the longer term. “Statistics show that attendance rates tend to be lower in schools with high levels of free school meal entitlement. A considerable amount of work is being done to tackle the issue of poor attendance. “My department has provided guidance to schools which provides good practice and strategies to manage pupil attendance. It also recommends that every school should have an attendance policy which is approved and endorsed by the board of governors. “We also issued ‘School Attendance Matters – A Parent’s Guide’ to all schools for distribution to Year 1 and Year 8 pupils starting in September 2013. Professor Tony Gallagher is Professor of Education and former Head of the School of Education at Queen’s University Belfast. We asked him to comment on the latest school performance data and our analysis of it. He said past evidence suggests that the key factors influencing the performance of secondary schools are: gender (girls do better than boys), free school meal entitlement (schools with higher levels of FSME do not do as well as schools with lower FSME) and management type (maintained schools do better than controlled schools). And for grammar schools it is: gender (girls do better than boys), transfer grades (schools with more grade A pupils in their intake do better five years later in comparison with schools with lower percentage of grade As in their intake) and management type (schools under Catholic management tend to do a little better than those from other schools). Professor Gallagher said: “With falling rolls the number of pupils going to grammar schools has stayed stable, which inevitably means that they are taking a wider range of pupils in comparison with the past. However, there is no evidence that the social profile between grammar and secondary schools has narrowed. He added that if pupils are not in school then they cannot learn, so schools with high levels of absenteeism will see this reflected in their performance levels. He continued: “One further issue is whether we are using the most appropriate measure of performance. “The criterion of five or more good GCSEs harks back to the time when pupils needed to pass a certain number of O-Levels to hold onto a scholarship. “Whether this is an appropriate criterion at present is difficult: there is a risk that using the five or more good GCSEs criterion encourages schools to focus on pupils who are predicted to achieve just below this level in order to bring them ‘over the bar’. “However, if this happens then the risk is that pupils predicted to achieve much lower levels of performance may be neglected.